Learning how to take pictures of paintings and other works of art is a simple process. 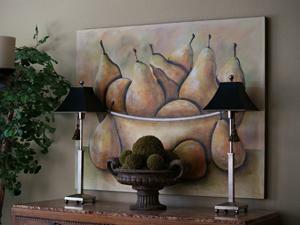 Art collectors usually photograph their paintings for insurance policies. Keeping a visual record of the collection on file with an insurance agent makes the process of filing a claim much easier should fire, flood, or theft destroy expensive works of art. Another reason for art photography is so artists can produce digital versions of their masterpieces for displaying or selling on the Internet. No matter what your reason, you can take good photographs of your paintings with a minimum of time and equipment. Before you pick up your camera and start shooting pictures, take a few minutes to prepare, so that your images turn out crisp and clear. It'll take a lot longer to finish if you have to redo the entire photo shoot due to a missing piece of equipment or a small miscalculation. Review the steps below to learn how other photographers capture paintings on camera. Batteries or Film: If you're using a film camera, have three or four rolls of film on hand, and if you're using a digital camera, get enough batteries to swap out several times. This step ensures that you won't have to stop midway through the shoot. Memory Device: If you are shooting with a digital camera, make sure your memory card or stick is large enough to accommodate multiple images. Tripod: This is indispensible for capturing clear, sharp pictures that show off each stroke of the paintbrush. Lighting: Many photographers prefer to take pictures of paintings outdoors on overcast days or inside using indirect natural light. Indoor lighting may wash out your images, cause bright spots, or subtly alter colors. Location: Figure out where you're going to shoot your photos ahead of time by taking a few practice shots, and then looking them over carefully. The debate over film versus digital cameras extends to painting photography. The easy answer is to use whichever camera you have on hand or feels right. Most people have stopped using film, and that's not a bad thing in this case. Digital photography works at least as well as film photography for taking photos of art. Using flash, especially with a simple point-and-shoot camera, is a bit tricky. Too much light can cause hot spots and glares on the final product, and too little light mutes important details of the painting. The rule of thumb for photographing art is to turn off the flash and shoot your photos in a light setting like the one mentioned in the equipment section. An exception to this rule applies if you're using a high-end camera equipped with special flashes and filters, but even then you may have better luck shooting without flash. If your paintings have nice frames, they will probably look fine in a digital image. If your frames are cheap or shoddy, you can either remove them manually or crop them out later with photo editing software. You may damage old paintings if you try to take them out of their frames, so use whichever method is most comfortable for you.